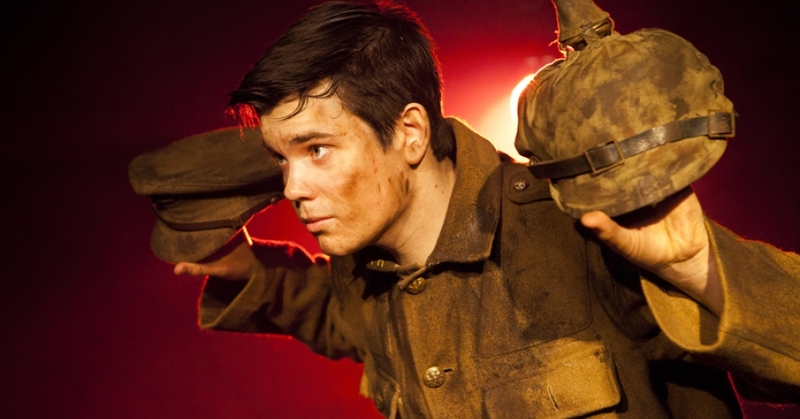 Alex Gwyther as Pvt. James Boyce. Maybe our interest in this centennial has seemed lacking so far because we didn’t enter The Great War until 1917. Or maybe it’s because others’ losses were so much more devastating than our own – we lost more than 53,000 lives but half of all Frenchmen who were between the ages of 20 and 32 died, and more than 35 percent of German men ages 19 to 22. On December 7 that year, Pope Benedict XV called for a Christmas Eve truce, “that the guns may fall silent at least upon the night the angels sang.” His plea was rejected. That Christmas of 1914, the peace lasted in some places longer than others; and in still others it never happened at all. Afterwards, word came from on high that such behavior — insubordination! — would never again be permitted. One German infantryman in the trenches also thought it was a disgrace. “Such a thing should not happen in wartime,” he declared. His name was Adolf Hitler.